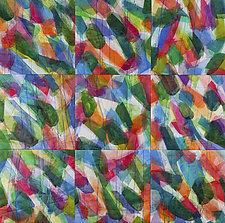 "My work is about color, rhythm, and pattern. For me, one bird in flight is interesting, but the sight of many birds flying in formation is mesmerizing. The same is true for other patterns around me: ocean waves, trees, blades of grass. Living in Alaska and Maine and having traveled throughout North America, Europe, and the Carribean, I've gathered a range of visual influences. 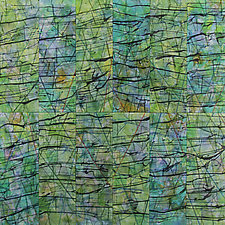 Patterns created by the sunlight, colors, and the environments unique to each locale are the inspirations for my art." Fiber artist Nelda Warkentin uses multiple layers of fabric and machine stitching to form her quilts, basing them on a rigid inner layer of canvas. While her work can be viewed simply as abstract art, each of Warkentin's pieces present us with meaningful metaphors about life. For example, her work is created in layers, resulting in pieces with depth and complexity. 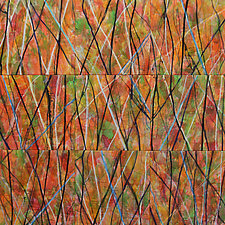 Secondly, pattern and rhythm are integral to her art. The world is full of cycles; pattern and rhythm can be found in everything. Finally, each part of the pattern is unique, yet the parts overall are similar. 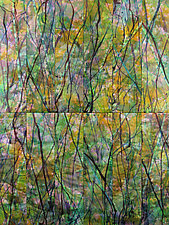 Warkentin creates her abstracts by applying layers of painted transparent silk over a background image. She paints the silk three to five times with acrylic or pigment mixed with water. After each application, she dries the silk to maintain the transparent nature of the surface and to allow the application of color on top of color. Behind the silk surface are pieces of silk, linen, or cotton (which may also be painted) machine stitched onto canvas. The viewer sees these background layers through the silk surface, resulting in a painterly quality that offers endless opportunities for study.